The upper house Senate voted 39-32 to scrap the charge, which was imposed by the former Labor government on major polluters from 2012 in a bid to reduce greenhouse gas emissions. It followed days of protracted negotiations with the minor Palmer United Party, which embarrassed the government last week by pulling its crucial support for repeal of the tax at the last minute. Power-broker Clive Palmer backed the legislation after winning concessions for tougher measures to ensure cuts to electricity and gas prices were passed through to consumers and businesses. 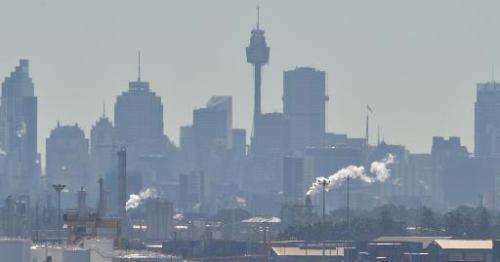 Prime Minister Tony Abbott went to the polls in September with repealing the pollution levy as a central campaign platform, arguing the cost was being passed to consumers, resulting in higher utility bills. "Scrapping the carbon tax is a foundation of the government's economic action strategy," said Abbott, who once said evidence blaming mankind for climate change was "absolute crap". "A useless, destructive tax which damaged jobs, which hurt families' cost of living and which didn't actually help the environment is finally gone," he added. The government must walk a tightrope in the upper house, needing the backing of minor party senators such as those from Palmer's party to get its legislative agenda passed if it cannot secure support from Labor or the Greens. This includes not only scrapping the carbon tax but the massive spending cuts it has planned to bring the budget under control. EU Climate Action Commissioner Connie Hedegaard said the move was regressive. "The European Union regrets the repeal of Australia's carbon pricing mechanism just as new carbon pricing initiatives are emerging all around the world," Hedegaard said in a statement. "The EU is convinced that pricing carbon is not only the most cost-effective way to reduce emissions, but also the tool to make the economic paradigm shift the world needs." 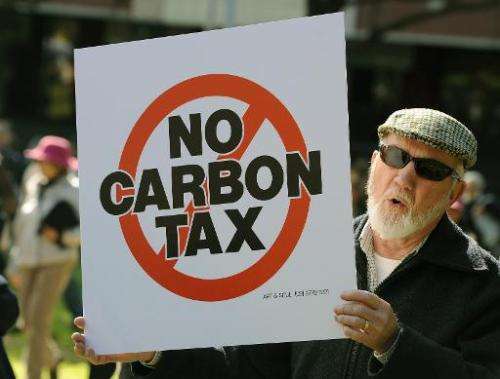 Abbott's conservative government says dumping the tax would save households Aus$550 a year and strengthen the economy, which is among the world's worst per capita polluters due to its reliance on coal-fired power and mining exports. Under the carbon tax, the country's biggest polluters, including mining, energy and aviation companies, paid for the emissions they produced, giving them an incentive to reduce them. The current administration favours a "direct action" plan that includes financial incentives for polluters to increase their energy efficiency. The Climate Action Tracker, an independent monitor of countries' carbon pledges and actions, has said this method will increase Australia's emissions by 12 percent in 2020 instead of reducing them by five percent from 2000 levels as per its own target. Michael Raupach, director of the Climate Change Institute at the Australian National University, said repealing the law was "a tragedy, not a triumph". "It flies in the face of three giant realities: human-induced climate change, the proper role of government as a defender of the common good, and the emerging quiet energy-carbon revolution." Big business welcomed the repeal with mining giant BHP Billiton saying the tax had "a detrimental impact on Australia's competitiveness", but Labor opposition leader Bill Shorten said Abbott had "embarrassed Australians". "Tony Abbott is taking Australia backwards while the rest of the world is moving forward," he said. "All of Australia's major trading partners are taking serious action on climate change, including in our own region." Greens leader Christine Milne joined Labor in expressing outrage, saying abolishing the tax would make Australia an international "pariah". "It is a monumental blunder for the nation under a climate-denying prime minister," she said. "It will make life worse for future generations and make Australia a global pariah." Abolition of the tax caps years of bitter debate. 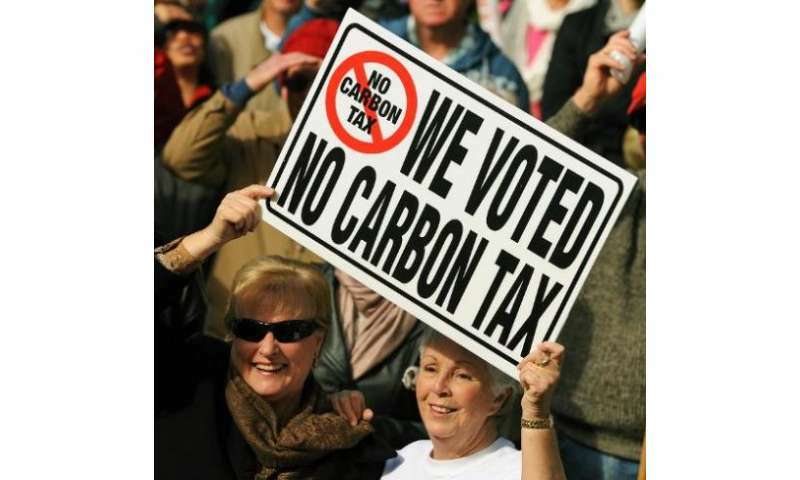 Former Labor prime minister Julia Gillard promised voters there would never be a carbon tax under a government she led, and then announced a fixed price on carbon pollution after she won the 2010 election. The "broken promise" dogged her for years with Abbott's "axe the tax" rhetoric eating away at her government and ultimately paving the way for her toppling as Labor leader by Kevin Rudd, who then lost the September election. Another nail in the coffin of AGW deceit and ignorance. The sea ice around Antarctica is expanding. In couple hundred years it will engulf Australia. Oh, one can't make predictions that far into the future? Sure you can: google "West Antarctic Ice Shield melting". The globe is really getting warmer, you see, except in a few places, like Antarctica (record cold yesterday), Australia (see above), North America, Europe, Greenland, and basically anyplace there is a thermometer. It's the Schroedinger's Cat paradox of CAGW: the warmth is there, except when you go to measure it. Now can we finally stop calling carbon dioxide, which is vital to almost all photosynthetic organisms, "pollution"? And that picture of Sydney is an outright fraud. CO2 does not cause smog. Nitrogen and sulfur oxides and volatile hydrocarbons do. Real scientists have known that for ages. Finally, who cares what the EU thinks any more. Surely nobody in Europe. Prime Minister Tony Abbott says "A useless, destructive tax which damaged jobs, which hurt families' cost of living and which didn't actually help the environment is finally gone". It actually seems like he is talking about himself "A useless, destructive MAN which damaged jobs, which hurt families' cost of living and which didn't actually help the environment is finally VOTED OUT OF OFFICE". The Carbon Tax issue in Australia has been good for Tony Abbott. It caused the Labor Prime Ministers Kevin Rudd and Julia Gillard to lose their jobs, the opposition leader Malcolm Turnbull to be dumped by Tony Abbott prior to the last election, and it has cost the Greens the balance of power in the Senate. It won't be long before Australians wake up to the endless lies, deception, manipulations and fraud of this Tea Party vandal. So is water, but too much of it will kill an organism. The dose makes the poison. So, at what level does CO2 kill? At current rate of emission when will we reach that level?